If you’re thinking of buying a table tennis table for your home, your first big decision is where are you going to put the table – inside or outside? Actually this is ok. Outdoor table tennis can be great fun. It tends to have a more social aspect to it – drink, food, laughter, fun and games with friends and family. An outdoor table tennis table in the garden can provide hours and hours of entertainment. First a few words about the difference between indoor and outdoor table tennis. At a competitive level, both amateur and professional level, table tennis is most definitely an indoor sport. This is mainly to do with the weather. Table tennis balls are very light, so any kind of wind can have a big impact on the flight of the ball. And if there are any wet patches on the table (because of rain), the ball won’t bounce, which makes it very hard to play. But despite the weather there is a growing popularity for outdoor table tennis. It isn’t as serious as indoor table tennis and is played more for fun – what you might consider more as ‘ping pong’. In many countries, there are outdoor table tennis tables dotted everywhere – parks, schools, train stations, shopping areas. In many cities in the UK, we now have lots of outdoor tables thanks to a project called ‘Ping’. And the ITTF has an introduced a new informal version of table tennis, called TTX, which can be played indoors or outdoors. When thinking about getting a table tennis table for your home, the biggest advantage of an outdoor table is you have more space to play. Most people don’t have enough space inside their home for an indoor table. You actually need a fairly big sized room. This is less of an issue if you get an outdoor table. If you have a garden, even a small sized garden, you should have plenty of space to play (more on this later). The biggest disadvantage is the weather. If there is too much wind, it is much harder to play, although it can be fun trying to battle the wind and your opponent – you get to play some crazy shots! If it is raining a lot, then just forget about playing. This is no fun. But you can play through a light drizzle. When the sun is out and there’s not much wind, outdoor table tennis can be great fun. Indoor and outdoor table tennis tables are very similar. They are the same width, the same length and the same height. The biggest difference is the material the table tennis top is made from. Indoor tables are solid wood. Outdoor tables are a mixture of metal and wood and finished with a coating to protect the table from sun, rain and wind. Outdoor tables also tend to have sturdier frames, which adds a little to the overall cost. I wouldn’t recommend using an indoor table outside, as the wood surface can badly deteriorate if it gets wet or exposed to too much sunlight. And the frames aren’t as sturdy and won’t hold up that well if you have a slightly uneven surface. So if you want to have a table tennis table for your garden, get a proper outdoor table tennis table. There is a difference in how the ball bounces on an outdoor table compared to an indoor table. With an outdoor table, the metal/wood surface absorbs some of the energy of the ball, so it doesn’t bounce quite so well and the ball comes off the table a little slower. But, unless you’re playing at a high competitive level, you’re probably not going to notice much of a difference. And quiet honestly, I’ve played league matches on some old and slow indoor tables with some big dead spots – so it’s not as though all indoor tables are perfect. A couple of years ago, I used to go to someone’s house to do some coaching. He had an outdoor table, but set it up in his garage. We did a lot of coaching on this table and it was absolutely fine for the standard he was playing at. Ideally, you need an even surface when setting up your table outside. You could set up on a patio area or a flat grass area. You can adjust the leg heights to even up the table, so even if you surface isn’t completely flat, you can still make the table top even. Some wind protection can help. If you can position the table near a garden fence or the side of the house it will reduce some of the impact of the wind, although on a very windy day, it won’t make much difference. In terms of space – the table length is 2.74 metres and the table width is 1.525 metres. You will also need a minimum of approx 5 steps back from the end of the table and 2 or 3 steps to the side of the table to have enough room to play. You should measure this out in your garden before buying to make sure you have enough space. It’s best to buy an outdoor table which folds (most do), so that you can store it away neatly when you have finished playing. 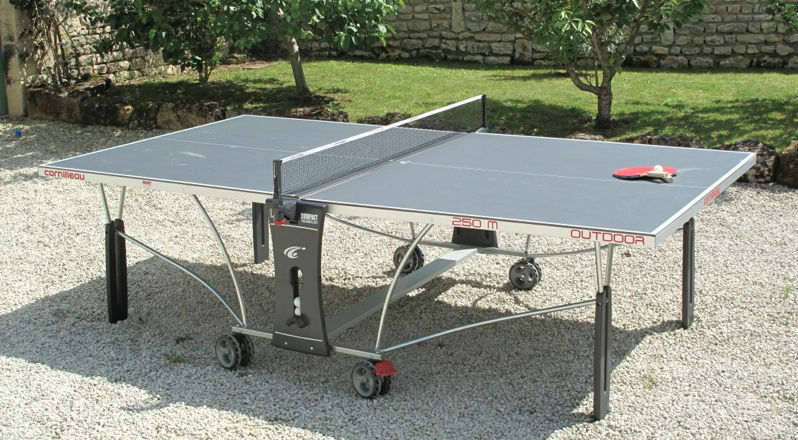 An outdoor table tennis table can cost anywhere from £150/ $200 up to £1000 / $1500. If you have read any of my other equipment articles, you will know that I always recommend that you don’t buy the very cheap options. I’m going to give the same advice for outdoor table tennis tables! The budget price outdoor tables are quite flimsy, more likely to break and the bounce of the ball is terrible. To get a decent outdoor table tennis table, which will last you many years and has a decent bounce, you’ll need to spend in the region of £300-£500 / $400-$600. There’s quite a lot of choice available. Kettler and Cornilleau have a good range of outdoor tables. These two brands are what most people buy for their garden. The more well known table tennis brands, such as Butterfly, Stiga and Joola, also produce outdoor tables. The quality is good, although they tend to be a little more expensive. Here’s a few recommendations on which tables to buy. If you click through the links below, you’ll also be able to read reviews from other people who have purchased these tables. If you want to do your own research, take a look at my list of table tennis shops. Most of these will have outdoor table tennis tables for sale too. BEST-SELLERS: You may also want to take a look at my list of the most popular table tennis tables purchased by readers of my website. Finally, a word about protecting your table. Even though outdoor table tennis tables are made of materials to survive outdoor weather conditions, they are not indestructible! If you leave the table unprotected all year round, you will experience some deterioration. Your table which last much longer if you fold it up after use and put a protective cover over it. Some tables come with a cover. If yours doesn’t you can buy one fairly cheaply. Here’s a decent option you can buy on Amazon UK or Amazon USA. What’s the best way of preventing the table on wheels from sailing off and getting damaged in high wind? Most tables will come with wheel locks to keep the table stable. The tables are very heavy. I have never heard of a table blowing away. When not in use, it’s best to fold the table, put a cover on it and place near to a wall. No chance of it blowing away. i would like to make a 15’ x 10’ area to play ping pong outside. what type of crushed stone would you recommend for good footing and easy movement? I have to admit that I am not an expert on crushed stone. I would have thought the crushed stone shouldn’t be too big, as this won’t be comfortable to play on. But probably best to speak to a crushed stone company to get their views. Tom, what is the best colour for an outside table blue or green? I don’t think it matters too much, but most outdoor tables I have played on are blue. Not sure why, maybe you get a better contrast with daylight. Both Kettler and Cornilleau make very good outdoor tables. Go for the most table thickness you can afford with your budget. What are your thoughts on this £230 table at Decathlon? It looks very similar to the ones you linked at Amazon, and seems very well reviewed for the price! I’ve not used this table, so wouldn’t like to recommend one way or another. But it seems ok for a basic table and has plenty of positive reviews, so could be ok.
Do you have any advice on suitable balls for use outside? You should go for good quality training or competition balls. Avoid really cheap light balls as these are effected by the wind more. Take a look at my balls guide for recommendations. Can you suggest how to play on outdoor tables, I’m very comfortable with indoor tables but loose all games on outdoor so could you suggest any technical change on playing style e.g. more loop or play more solid contact? Playing on outdoor tables can be tricky if you are very used to playing indoors. Any kind of breeze can really throw off your timing. Personally, I find it easier to play topspin-drives, so still enough spin to clear the net, but contact a little flatter so less effected by windy conditions. What surface material would you recommend for an outdoor table Tom; melamine, resin or aluminium?